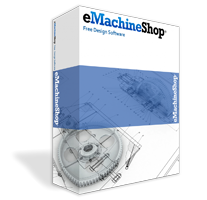 This section covers a variety of methods of moving designs into eMachineShop CAD from other sources and exporting. If you have a drawing in PDF format, first use a PDF to DXF converter. Then follow the method below starting in the eMachineShop CAD. The eMachineShop CAD software currently has an alpha-stage capability to import limited very simple 3D and 2D STEP and IGES solid geometries (not 3D curves). Be sure to check the imported design for correctness and completeness. To use this capability simply select File | Import. If this method is not able to import your file please follow the other methods on this page. If you have a CAD file that can output the cross section of a turned part, consider the following method. In the other CAD program export the side view profile of your part to DXF format. Choose File | Import and import the DXF file. Select the imported lines and choose Edit | Cut. Draw a circle with diameter equal to the max part diameter. Choose Line | Machine | Auto. Set Z to part length. Choose View | Front and Edit | Paste. Move the pasted profile within the light color boundary line to the right of the center axis (if you are using the full side view, divide it in half to show just the right side). Choose View | 3D to check the 3D view. Imported files often have a large number of small line segments which slow the eMachineShop CAD software and may increase pricing. Therefore, after importing it is recommended to simplify lines. Look on the status bar to see the number of segments. For example if you find a circle made of 100 small line segments you should delete them and draw a primitive circle. In some cases it might be worthwhile to drew new lines over existing ones and the delete the old lines – this will simplify drawings the most. You can create a design from a physical object or an image of the object using the Tracing feature. In the other CAD program open the design and set scaling to 1:1. Direct the CAD software to make a drawing of the part using the minimum views that represent all the features. (The needed views correspond to the orientation of the raw material during milling. Start with just one or two key views if you are unsure – you can add other views later if needed.) For 2D parts you only need one view. Export the drawing to ASCII (not binary) DXF format. Delete any unnecessary projection and guide lines, etc. Choose the view with the largest area to become the Top view. Select any other views and choose Line | Machine | Comments to Self. In the Top view click on each line looking for any line that are not closed contours. Add lines as needed and Group them to create non-intersecting closed contours. For each contour line choose Line | Machine | Auto and add any needed chamfers or other edge effects. For each contour line set the Z value (positive for protrusions, negative for recesses, Air Inside for thru features). For each additional view: cut and paste lines from the Top view to the appropriate Front, Back, Left, Right, or Bottom views; align with the projection lines; choose Tools | Compute | Projection Compliment; and set the Z value of each line. Select View | 3D and resolve any error messages. Exporting is the process of converting a design into another file format. You can export an eMachineShop CAD file to STL format. Consider making a copy of the design file and removing some features to isolate the problem. Choose File | Export to STL.